We're back with another special post, because: WOW, some MAJOR gown and jewel happenings went down in the Netherlands tonight. Those who follow Dutch royal jewels have been waiting to see if Queen Máxima would break out the Stuart Tiara, that enormous diamond tiara not seen since the days of Queen Juliana. Would she do it for the state visit from Argentina, her home country? Well, no - but she did inch one step closer to the big reveal. Honestly, she's just teasing us now. King Willem-Alexander and Queen Máxima hosted a state banquet on day one of the state banquet from the President and First Lady of Argentina. But really: THIS NECKLACE. It's the massive Stuart Diamond Necklace (or House Diamond Necklace, if you like), and man oh man is it stunning. 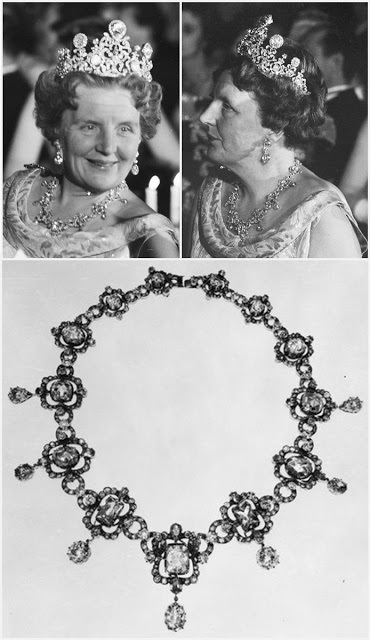 This necklace uses old diamonds from the house collection and is most associated with Queen Juliana, who wore it as part of a parure with the Stuart Tiara. Princess Beatrix was never big on elaborate necklaces, so this one also hasn't been seen since the 1970s. Bonus sparkle: Princess Beatrix can be glimpsed in the video below wearing the Antique Pearl Tiara.